The birth of William Joseph Rumble was registered in early 1889, but the Army records his name as Joseph William. His parents, Joseph Rumble and Sarah Jane (née Walker) appear to change their minds, recording him as Joseph in the 1891 census and William in 1901. As he appears to have identified himself to the recruiting sergeant as Joseph William, he will be referred to in the remainder of this tale as Joseph. His surname is also flexible appearing in various records as Rumble, Rumbel and even Rumbold, though Rumble is predominant. Joseph was born in Cold Ash, the second of four children; his siblings being Maria (born 1886), Charles (1891) and Lizzie (1892). 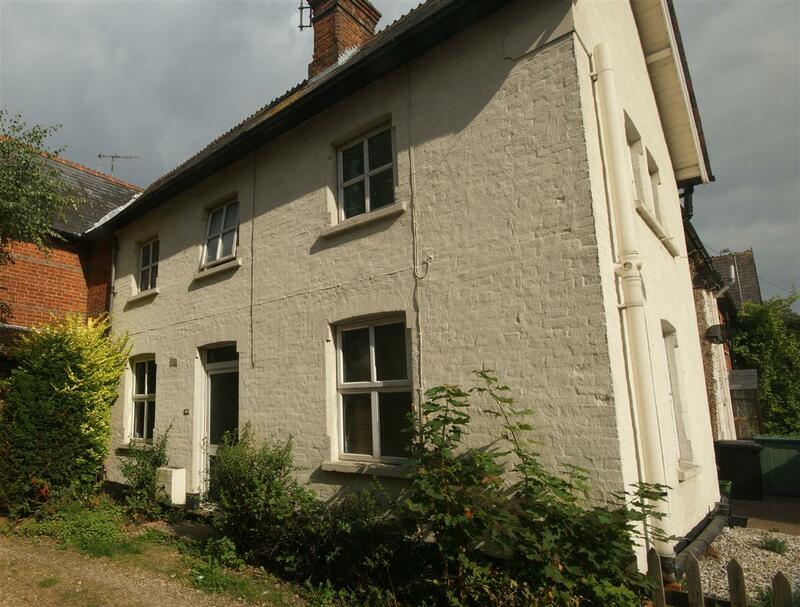 By 1900 they had moved to 5 Rosebery Place, Greenham Road, Newbury (the cottages opposite the Blue Ball public house). Joseph senior died in 1902 and was buried in Newtown Road Cemetery on 10 February – he was only 37 years old. Sarah was left with the children; the only assistance available from the state was the Workhouse. She would do her utmost to avoid such a fate, taking on whatever work was available and accepting whatever help was offered by family and friends. At least Maria had left school and was able to work and help with the family budget. Nevertheless there was another solution, one chosen by many young widows – to remarry. In 1903 Sarah married William Barrett, a widower who lived next door at 4 Rosebery Place. William’s wife had died in 1901, leaving him with a family to care for, though the Barrett children were all of working age (over 14) when their mother died. In 1906 Sarah too died, and was also buried in the Newtown Road Cemetery on 12 July; she was 47. It is not known whether the children remained with their stepfather or moved in with other relatives. Joseph chose to join the army and, on 6 April 1904 he enlisted with the Royal Berkshire Regiment. His step-brother, Henry Thomas Barrett, was already serving, perhaps this was an influence on young Joseph? It appears that Joseph lied about his age when he enlisted, saying he was 18 years old whereas he was actually only 15. Certainly the army listed him as aged 25 in the 1911 census return for his battalion – which equates to his being 18 in 1904. The 1911 census has his sister Maria working as an upholster while boarding with John Franklin and his family in Russell Road, Newbury; brother Charles was working as a dairyman in Sunningdale and little sister Lizzie was a kitchen maid in Sunninghill. These last two were at the other end of the county, not a natural place for Newbury children to find employment, which leads to the suspicion that they had been placed there by the Board of Guardians. The Board of Guardians was the committee that ran the Union Workhouse in Newbury, they would have been keen to ensure that fit teenagers were gainfully employed and would have the contacts to find positions for them all over the County. The census return featuring Joseph was completed for the 2nd Battalion, Royal Berkshire Regiment (2nd Berks), which, at the time, was in India. Later that year the battalion took part in the Delhi Durbar, where the new Emperor (George V) was introduced to his Indian subjects. A special medal was issued to the soldiers on parade during this lavish spectacle. Joseph did not receive this medal, suggesting that he had left for home after completing seven years with the regiment. A typical enlistment in this period was for 12 years, 7 to be served in uniform with the regiment (with the colours) and 5 to be served in the Reserve while living as a civilian. Thus Joseph should have been released to the Reserve in April. It appears that he found work in Newport, Monmouthshire as this is given has his address in several sources. However, nothing is known of this period of his life. After war was declared on 4 August 1914 Joseph and his fellow Reserves received their mobilisation papers almost immediately. He would have reported for duty at Brock Barracks in Reading, but he did not arrive in time to be among the 540 Reservists sent to make up the numbers of the 1st Battalion, Royal Berkshire Regiment (1st Berks) at Aldershot before they set off for France on 13 August. 1st Berks were part of the initial response to the German threat, they crossed the Channel on 13 August with the 6th Brigade, 2nd Division a part of I Corps of the British Expeditionary Force (BEF). Reservists reporting for duty at Brock Barracks in Reading - August 1914. Joseph was probably sent to Cosham, where the 3rd Battalion (3rd Berks) was mobilising with about 550 men. The battalion then moved first to Fort Purbeck and then to Victoria Barracks, Portsmouth becoming a part of the Portsmouth Reserve Infantry Brigade. This battalion never went to the Front, though it was sent to Dublin for a short period in 1917. Instead it acted as a training and recuperation unit – introducing new recruits to the army and easing soldiers recovering from wounds back to fighting fitness. However, Joseph was not with the 3rd Berks for long, he crossed to France on 27 August 1914, by which time the BEF had been in action for several days and was steadily retreating before the advance of the numerically superior German forces. This was a period of barely ordered chaos, time after time units of the BEF (including the 1st Berks) fought ferocious rearguard actions as the BEF and their French and Belgian allies struggled to contain the German onslaught and avoid a catastrophic defeat. It is unlikely that Joseph took part in the retreat, in all likelihood he was rushed towards the front where all units were desperate for reinforcements, but he probably wouldn’t have joined his battalion until they had crossed the River Marne and turned to face the oncoming Germans. The battalion’s first reinforcements arrived on 4 September when the 1st Berks was at Mouroux, a second batch of men joining the battalion on 7 September, by which time it was at Chateau-de-la-Fortelle – Joseph was almost certainly in one of these two drafts of reinforcements. On 9 September the 1st Berks crossed back over the Marne at Charly-sur-Marne as the Allies started back towards Belgium, pushing the Germans back the way they had come. Mr William Barrett, of Dothan-place, Cheap-street, has had three sons, a step-son and a son-in-law, serving in the King’s Forces. They are George William, National Reserves; Henry Thomas, 3rd Royal Berks, killed in France on October 26th; Charles John, Bedfordshires; Joseph Rumbold[sic], Royal Berks (wounded), and Thomas Allen, Royal Berks. In early November 1914 the 2nd Berks arrived in France with 6th Division having made the long journey home from India. Both the 1st and 2nd battalions were heavily involved on the Western Front for the remainder of the war. At some point Joseph seems to have transferred back to his old battalion, the 2nd Berks. Many men served in more than one battalion, this would not have anything to do with sending him to his ‘proper’ unit. It is most likely that Joseph’s wounding offered him a chance to rejoin is old mates in the 2nd Berks, probably in early to mid 1915 – though no record survives to show when he actually changed battalions. Whenever the transfer happened, he was definitely with the 2nd Berks by late 1917. According to most history books the 3rd Battle of Ypres ended on 10 November 1917, when the Canadian Corps finally captured the village of Passchendaele (hence the popular name of this horrific battle). General Haig called an official end to the battle when he launched another offensive (the Battle of Cambrai) on 20 November. After the war a Battles Nomenclature Committee concurred with this timing and set 20 November as the end date. However, there was a final blow to be struck. The intention was to complete the capture of the main ridge northward to Westroosebeke – a spur of high land leading north from Passchendaele. This was all that remained in German hands of the Passchendaele Ridge, which had been the initial target of the offensive launched way back in July. Two Divisions, the 8th and 32nd were tasked with carrying out the assault – which did not go well. An unpublished doctoral thesis1 (soon to be a book of the same name) that examines the action in great depth is entitled A Moonlight Massacre: The Night Operation on the Passchendaele Ridge, 2nd December 1917. The title says it all. The 2nd Berks were on the right flank of the attack and were the most successful battalion involved, but even they failed to capture all of their targets, notably a strongpoint called the Southern Redoubt, which they entered and engaged the enemy with bayonet and bomb (grenade) but were forced out by a counter-attack. Men were lost to shellfire while approaching the attack line, from small arms and machine gun fire during the advance across no-man’s land, in desperate hand to hand fighting in the Southern Redoubt and enemy trenches and to the artillery barrage put up by the enemy to break up the attack. Somewhere, sometime during that night Joseph was killed. He was numbered among the 49 other ranks missing when the roll was taken later that day. One of the 2nd Berks’ 154 casualties that night. 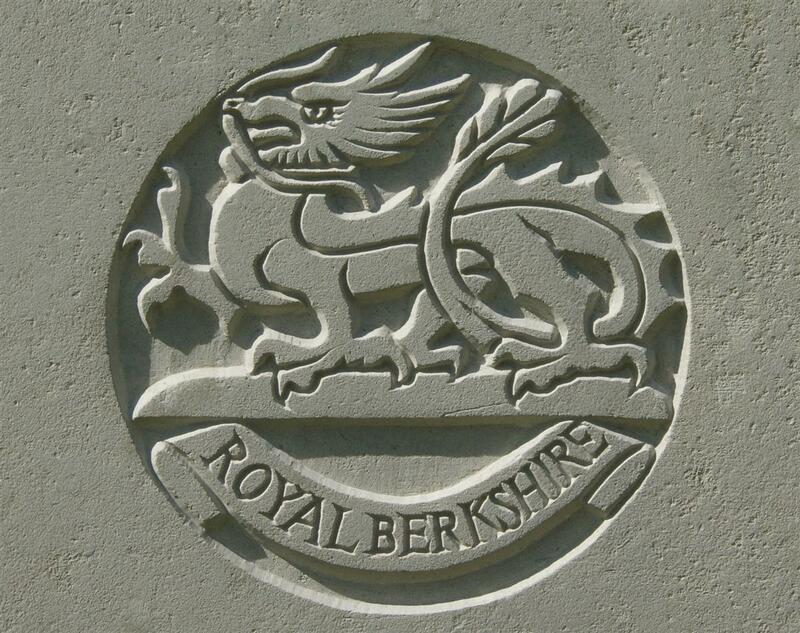 RUMBLE – Dec 2, 1917, killed in action in France, Corpl W J Rumble, 2nd Royal Berks Regt, of Newport, Mon, elder son of the late J Rumble and S Barrett, Greenham, Newbury, aged 28. His body was never identified; perhaps it lies in a neat cemetery, one of the many marked by a stone bearing the words A Soldier of the Great War? 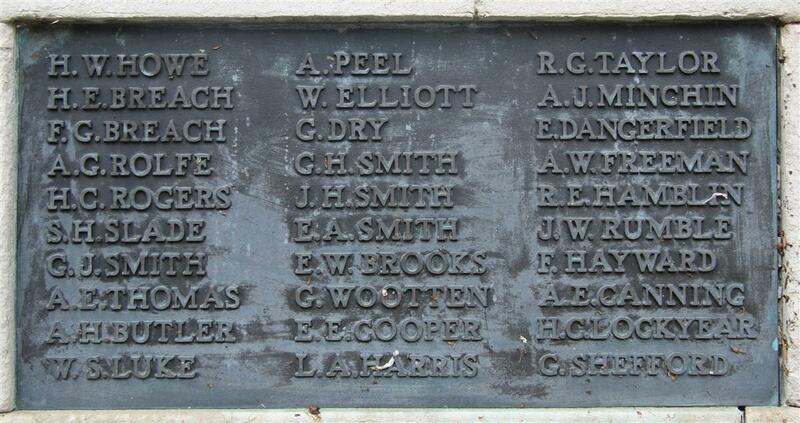 His name is remembered on Panel 105 of the Tyne Cot Memorial. This memorial records the names of 34,948 men most of whom who fell in the fighting in the Ypres Salient during the last two years of the war. It forms a wall to the largest Commonwealth War Graves Cemetery in the world - containing 11,956 graves, only 3,587 of which are of identified soldiers. One of the graves bearing a name is that of Joseph Rumbles’ step-brother, Henry Thomas Barrett who died in 1914; his body was found after the war at a time when the Tyne Cot Cemetery was being used to concentrate burials from various smaller cemeteries and as the final resting place for bodies uncovered during the initial post war clear up. He was identified by his identification disc. Locally Joseph is remembered on tablet 10 of the Newbury Town War Memorial separated from his step-brother who is on tablet 13. Brothers were usually listed together; it is likely that the relationship was unknown to the Memorial Committee.